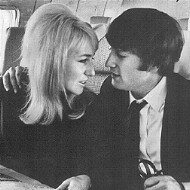 Two days later, John and Cynthia were inseparable, with a few exceptions of the Beatles' performances at the Cavern and some ballroom appearances and Cynthia's illness. One weekend, Cynthia woke up, feeling the same way as she did before. Her medicine bottle was nearly empty and by now, she felt that the medicine was totally useless. Something was up and she knew it. Phyl came by in time for their cinema date. During the bus ride, Cynthia complained that every morning she felt ill, sometimes during the day she felt dizzy, and realized that she hadn't received a visit from her period. Phyl listened and after Cynthia was done, she suggested that Cynthia go see her doctor. Cynthia raised her eyebrows, A doctor? Cynthia's not a real big fan with doctors, she's a big believer on curing herself, but since she had no clue what was going on, she agreed. "I'll call up and make an appointment for you, don't worry, she'll know what is up with your health," Phyl assured her. "Okay, I'll go but with one condition," Cynthia said. "What?" asked Phyl. Cynthia looked Phyl in the eyes and said, "If you go with me." Phyl nodded and said, "Sure, I'll try to make an appointment and tell my co-workers that it's for me," with a wink. That same night, since John wasn't spending the night with her, she spoke over the phone with him, telling him that she's going to the doctors to figure out what was wrong. John sounded relieved. Cynthia went to bed that night, but laid with her eyes open. She never had these symptoms before and reassured herself that it may be a nature's quirk and that the doctor will solve her mystery. After midnight, she finally fell asleep. In the morning, Phyl called to inform her that her appointment was the first thing tomorrow morning. "Great," Cynthia told her, but then she felt something in her stomach about to come up, "hold on," she told Phyl in a weak voice. She ran to the bathroom and threw up. After she was done, she came back to the phone and could hear Phyl shouting, "What's wrong? Please tell me? Do you need me to call the hospital?" Cynthia responded, "no, that's okay, it's part of my quirky illness." "Oh, okay, well, I'll come by tomorrow morning and catch the bus with you by eight in the morning, okay?" "Okay, that fine by me, see you later!" Cynthia and Phyl hung up. Cynthia lay back in the bed, but then she felt another tug going up from her throat and ran off to the bathroom again. During the whole day, her body traded in the throwing up to going to the bathroom. What was going on? Is my bladder the problem? She thought as she was going on one of these trips. She didn't even bother going out of the flat. The next day, by seven in the morning, she was up, throwing up in the toilet. After she felt that it was all gone, thirty minutes later, she decided that it was time to get ready in time for Phyl. She choose her black trousers and tried to fit in them�but they wouldn't zip up in the front. "Get..up�there!" she grunted to her zipper and jumping up and down. Why won't this zipper go up? Have I gain weight? These trousers fitted me fine just two weeks ago? She thought to herself as she was tugging up her zipper. She gave up and decided to wear a lose-fitting dress instead and made a mental note to complain to the doctor about her trousers not fitting, another thing to the long list. Phyl came in time by eight and Cynthia was ready. On the walk to the bus stop, they picked up some scones and some tea to munch on until the bus arrived. They arrived at the doctor's office in time for Cynthia's appointment. They waited not long for the doctor's receptionist to call Cynthia's name up. As Cynthia was leaving, Phyl told her that she'll wait here. Cynthia nodded and went in. After she sat down, and before the doctor even had a chance to sit down, Cynthia poured her heart out of all these symptoms; sick in the morning, dizzy sometimes during the day, starting to not fit in her clothes, her period not showing up�after she was done, she looked into the doctor's eyes, hoping that she knows the answer. The doctor hesitated and then started to speak, "Ms. Powell, with all the symptoms that you've just told me, I will think that you are pregnant, but first we have to take some tests to make sure one-hundred percent." Cynthia started to quietly panic. Pregnant? I may be having a baby? I don't know nothing about babies, I don't want babies, I want my career first! The doctor then got up to her medication cabinets and took up one syringe and a cup, asking Cynthia to roll up her sleeves. She used the syringe to take some blood out and then after bandaging the arm, she asked Cynthia to go to the bathroom and to pee into this cup for an urine sample. Cynthia followed her orders, she had to go anyway. A few seconds later, she came out with the cup full of urine and gave to the doctor, who then left to drop off at the lab. She came a few minutes later, asking her to wait in the lobby for a few minutes and wait for the results. Cynthia did as she was told. Phyl asked her what was wrong. "She thinks that I may be pregnant," Cynthia told her. Phyl's mouth dropped open and then quickly closed it. "What is it?" asked Cynthia. "Well�you and John are a couple of bunnies," Phyl told her calmly, "I'm not a bit surprise that you two will have a child." Cynthia sat back in her chair, thoughts were zooming around her head. What am I going to tell John? What is he going to do? Am I ready to be a mother? Is he ready to be a father? What are we going to do? How am� her silent questions were interrupted when the doctor came out and asked Cynthia to step in her office again. Cynthia sat down nervously, her eyes were welling up in tears as she looked straight into the doctor's face. The doctor took a deep breath, "Ms. Powell, we got the results from both your blood and urine samples and indicating from your explained symptoms, you are indeed pregnant." Cynthia was shocked. Those thoughts returned to her head. She walked past the receptionist who told her that she will receive the bill in the mail and Phyl got up and lead Cynthia to the bus stop. Once there, Phyl turned to her, "Well?" Cynthia turned to Phyl and told her, "I'm pregnant". Phyl opened her arms and Cynthia collapsed in them, they hugged and Cynthia started to cry, "Oh, what am I going to do? What am I going to do?" "Well, you have to tell John, that's what you are going to do," Phyl told her, "He may know what to do." "But�but we aren't ready yet, what if he dumps me? What if�" "Quit it!" Phyl exclaimed, "John will not dump you, I know that for the fact." "How do you know?" asked Cynthia. "Because," Phyl explained, "he loves you very very much, although you two are different, you two are perfect and John will do the right thing, you wait and see." Cynthia got quiet for a moment and then asked Phyl, "Could you stay here for when I tell John?" Phyl told her no, she has to work, and this is her news, Cynthia has to do the job and tell John that she's expecting. "Sorry Cyn, but this is your news and John is your boyfriend. I'm not a part of this." After Phyl dropped Cynthia at her flat, she quickly left to go to work. Cynthia sat on her bed for what it seemed eternity. I'm pregnant. I'm going to be a mother within eight and a half months. John's going to be a father. What am I going to do? I don't have enough money nor room to have a baby. John's music career is taking off�but it's an undecided future. In the meantime, we are both broke�What am I going to tell my mother?! Later that evening, John came over. He had just been at NEMS office after a meeting with Brian to inform the Beatles that George Martin is willing to produce them in London by September. Cynthia munched on her soup and was quiet the whole time while John was raving about the excitement that the Beatles were going up. Cynthia looked over at John's face, he seems so excited that things were taking off for them, how is her news going to affect that? Cynthia suddenly felt sick to her stomach and stopped eating. She went to her kitchen where John followed her, continuing his story. She started to clean up and John stopped flat, he realized that Cynthia was more unusually quiet than usual, something must've gone wrong. "So, how was the doctor's visit? Anything matter?" he asked in a concern voice. "Yes, something is the matter," Cynthia icily told him. "What's wrong?" he asked, leaning against her stove. Cynthia stopped cleaning and turned to John, tears were starting to well up inside. "The doctor informed me that I'm pregnant, that's what's wrong!" Cynthia's tears started to come down. John was shocked, his face went white and his own thoughts caressed his head. He quickly came into a conclusion. He moved over to where Cynthia was standing and crying and put his arm around her, "It's okay Cyn, we'll get married and I'll go tell Mimi and set the whole thing up, it'll be all right." Cynthia pulled away and went straight to her bed, flopping down. John followed her and lay down with her. Her stomach was to the bed and he felt an urge to feel it, his child was in there. John leaned in and told her that it's going to be all right, Cynthia turned to look at him, her whole body turned. He put his hand on her stomach and rubbed it gently, Hi there, he thought to his child, I'm your father. "Don't worry Cyn, we will get married and the child will have a mother and a father who will love him and be there for him�unlike my own father, I'm going to make sure that my child will have a father," John told Cynthia, cradling her into his arms. After a few minutes, Cynthia's crying started to calm down and John realized that he had to go and tell his Aunt Mimi the news that within a few days, he'll be a married man with a child on the way. He looked at Cynthia, he didn't want to go, he wasn't looking forward of telling Mimi his news nor he didn't want to leave Cynthia alone. But he really had no choice. It was now or never to go and tell Aunt Mimi. He turned to Cynthia, "I have to go and tell Mimi now. Will you be all right?" Cynthia nodded. The couple loosen up and John left with a heavy burden on his shoulders. Cynthia went to sleep, her day was exhausting.